A relative newcomer to Birmingham at 11 months old, The High Field has some posh neighbours, nestled amongst St George’s Church, Simpsons Restaurant and next door to Edgbaston Deli / Norjske, the refurbed villa property certainly makes an impression from the street. Well served by local bus routes and a short walk away from Five Ways Island, it’s fast becoming a Birmingham favourite. It’s been on Wifey and mine’s list of venues to attend and we jumped at the chance of going down. The sunshine was not in attendance the day of our invite but it was still warm and the rain kept off for the most part. We stopped for a quick beverage at the bar and headed to the back garden to soak up the few rays on offer. 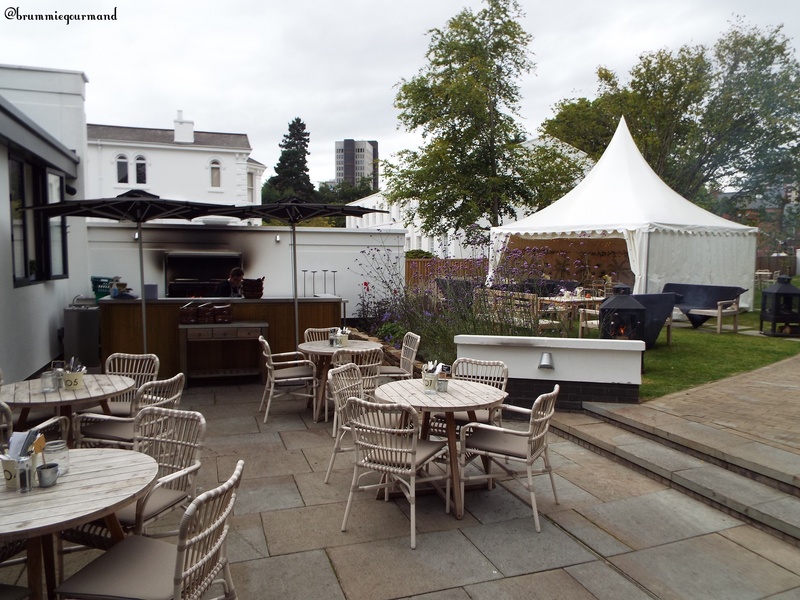 The garden was well stocked with an outdoor wood fired BBQ, tables chairs, parasols and a marquee (available for hire). I had a pint of Longhorn IPA (a personal favourite of mine, a no need to elaborate further), whilst Wifey went for a Peach Mojito. The sweetness of the peach balanced out the mint and made for a refreshing twist from the standard. Post beer, I swapped out to the prosecco sangria to match the summery mood being set. The prosecco sangria was sweet (a little too sweet for my personal tastes) but was fresh, cool and topped up with apple and citrus fruits which took the edge off a little After a chat to the staff and some fellow foodies, the food was up. Dean, the head chef, kept the food coming along and a selection of fayre was soon available to taste. The food choice included corn on the cob, jacket potatoes, chicken wings, beef and fish kebabs, salad, slaw and the highlight for me, dry rub ribs. The ribs were done right for me, crispy on the outside with juicy meat inside and went well dipped in a pot of spicy ketchup. The slaw also was a particular highlight with a rich sweetness complementing a veggie crunch. The jacket potato could have been cooked a little longer but the inside was warm, fluffy and hot. When that lot was washed down with some sangria, it was onto the dessert boards. A colleague who had visited prior raved about the huge strawberries in the dip your own and I’m happy to say they lived up to the hype. A pot of thick rich cream and a smaller pot of chocolate sauce gave a an excellent twist on a British favourite and I can’t wait to return so I can have a portion all for my greedy self! Post strawberries, I swapped out for the Eton mess. The fruit was plump, fresh and juicy; the meringue crispy and sweet; the cream rich and luxuriant. I can’t say much more about it because it didn’t last long enough to make any more mental notes. If you’d like the chance to try the BBQ yourself, there’s two special BBQ & Beats days on 15th and 31st August, where you get some jazz to make the food experience even more enjoyable. We’ll certainly be back again and hopefully next time the sun will have his hat on. Thanks to Adrian and the team for keeping us topped up and looked after. Disclaimer: For this evening, we were guests of The High Field who provided all food and some of our drinks; this provides no bias to the review. This blog is my own personal opinion and strives to provide an independent view, promoting, enjoying and reviewing the range of exciting food and venues in and around Birmingham.